Films centering on children and their love of animals always score big at the box office. “Free Willy,” “The Black Stallion” and “Benji” are a few classic’s for kids that come to mind. “Dolphin Tale” is a unique story that’s based on true events. Winter, the dolphin, became tangled in a crab trap resulting in an injury that ultimately severed her tail. The frightening aspect of Winter’s story are the circumstances of her spine, as without her tail she had to move side to side to glide through the water, this movement created bulges that would ultimately lead to her death. By enlisting help from a prosthetics specialist, Dr. Cameron McCarthy, played by Morgan Freeman. Winter’s new tail enables her to adapt and swim correctly. The screenplay by Karen Jansze and Noam Dromi was written to focus on a gamut of themes that work well; the loss of a parent, single parent families, over coming adversity and the notion of never giving up. The inspirational script is peppered with sub plots that are woven through the dolphin’s plight. Clearly, the script sets this film apart from others in the genre as the result is a heartwarming story that not only sends a strong message to children and families, but also educates. 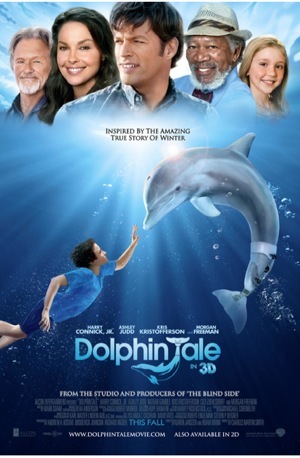 “Dolphin Tale” does so many things right, this child centered film touches heartstrings and takes hold for some time. As we root for Winter, we are also rooting for an 11-year old boy named Sawyer (Nathan Gamble) who’s withdrawn and non-trusting of adults. He prefers to spend time alone with his model airplanes instead of interacting with others. His father left the family without explanation several years ago and his mom (Ashley Judd) has trouble connecting with him until one day she sees a positive change in Sawyer’s disposition. The change is brought about by his interactions with Dr. Clay Haskett (Harry Conick Jr.) and his daughter Hazel (Cozi Zuehlsdolff ) at the Clearwater Marine Animal and Rescue Hospital, as well as his time spent with Winter. Director Charles Martin Smith told me during a recent interview that the film is really for everyone (not just kids) and I certainly agree. The story is told through the eyes of children but the message is woven through many of the characters and Winter is one of those characters. Through her perseverance and interaction with Sawyer, we view a special bond that all can identify with. Sawyer idolizes his cousin, (Austin Stowell) a champion swimmer who looses a limb and also has to adjust to a new life. The reality of finances are also brought into the script as the Marine Animal Hospital and Aquarium may have to shut down if money isn’t raised to help meet costs. Frances Sternhagen plays the head of the Aquarium board and gives a wonderful performance. Her eyes are also opened by the power of determination displayed by the children’s efforts to save the aquarium and Winter’s home. The film is available in 2D and 3D. I saw the film in 2D and could see the possibilities for 3D, especially in the opening scenes that depict Winter’s natural environment. Mark Isham created the stellar original musical score for the film. He worked with director Charles Martin Smith in another outstanding animal film, “Never Cry Wolf” (1983). The film’s message is summed up by this quote, “You never gave up on Winter and you never gave up on yourself,” spoken by grandfather, Kris Kristofferson, when he speaks to his son Dr. Clay Hassett. Bottom-line: An inspirational, multi-layered film for everyone that has depth and meaning for all. Another perk, Winter plays herself in the film, no double here.